Scheduled to begin shooting later this year in South Africa, "Judge Dredd" follows Dredd as he shadows a new recruit named Cassandra Anderson. Throughout the evening Dredd will decide if his new telepathic recruit is ready to be a Judge on her own. 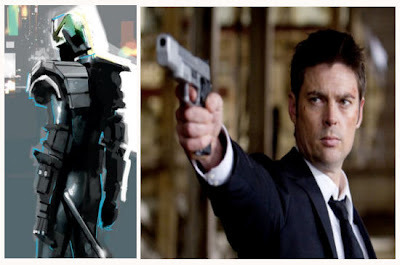 This storyline isn't too far off from the original 'Dredd' starring Stallone. This update is being financed by DNA Films to the tune of $45 million. Oh yeah, it will be 3D like everything else these days. Cassandra Anderson will be played by Olivia Thirlby. Yes, that's right, the over-talkative girl from "Juno." Truthfully, my excitement for this movie is dwindling extremely rapidly. First and foremost, I am not a believer that Karl Urban is going to be a very good Judge Dredd. Secondly, the script sounds just a bit too popcorn chewing and candy-coated for my interests. I really want a gritty dark account of the 'Dredd' comic and most of what has happened in pre-production has me getting more and more disappointed. Thirdly Thirlby. She's a cutie, but a new recruit as a Judge? Say what!? Besides, we've already seen Dredd working with a female recruit. Why couldn't this time around the story focus on Dredd? I'm also fairly worried about this telepathic arc to the Anderson character. Sounds like a terrible gimmick that will have some kind of cliched relevance in the futuristic action. Despite my negativity, I'm really trying to remain optimistic. I've really enjoyed screenwriter Alex Garland's previous work. The concept designs that have been released are immaculate. Also with Danny Boyle onboard as producer, hopefully he can help to keep the ship in safe waters.